One in five people suffer from workplace stress, with half a million people reporting they have become ill as a result. Massage can play a vital role in a health and wellbeing routine and is an excellent way to relieve stress both mentally and physically. Massage therapy can be used to relax your mind and body, relieve tension and may enhance mood. Giving employees and individuals the right tools, information and opportunity to change is vital when encouraging a positive health and wellbeing culture. Outcome: Reduces stress, relieves tension and pain, aids relaxation, can improve mood. . Increased energy levels and feelings of vitality. The Cyclo-ssage System is a medically approved device which incorporates nine massage units to produce a non invasive action known as Cycloidal Massage, targeting six different zones in the body; the neck, shoulders, lumbar, hips, hands and feet. The system has been designed to achieve deep tissue and muscle activity, relieving aches and pains associated with many conditions, or alternatively it may simply be used as a form of relaxation. The Cyclo-ssage System is a cost effective and easy way to provide massage. The Cyclo-ssage System is an excellent tool to encourage and engage people in their personal wellbeing, promoting health in a positive and rewarding way. Massage is a form of structured or therapeutic touch and is one of the oldest therapies in existence. We offer three types of massage; back & shoulder, Indian head and sports massage. Our onsite massage sessions are delivered by a trained therapist who will provide 20 minute clothed massage sessions. Using a portable and comfortable massage chair, our Massage Therapist will work on areas of your neck and back through your clothing, discussing with you any areas of concern. Indian Head Massage works on the head, neck and shoulders and helps to increase mobility and flexibility. Not only is it good of r reducing stress and tension, it also improves blood circulation, lymphatic flow and helps to eliminate toxins. The head neck and shoulders are important energy centres within your body. A back and shoulder massage promotes and enhanced feeling of relaxation and contentment. It has a soothing effect on the sensory nerve endings in the skin and improves blood and lymph circulation. It will also help to relieve muscular tension and pain in the neck and shoulders and can reduce headaches. Sports massage can alleviate pain that occurs in certain parts of the body, which can be caused by too much physical activity. Originally developed for athletes as a way to prevent and relieve injuries, sports massage is good for non-athletes too by minimising muscle tension and improving flexibility and range of movement and in turn provides a deep sense of relaxation. A major benefit of massage is the relief from pain due to musculoskeletal injuries and other causes. Massage also stimulates the release of endorphins, the body’s ‘feel good’ chemicals. These chemicals increase relaxation and help reduce ‘stress chemicals’ such as cortisol and noradrenaline. 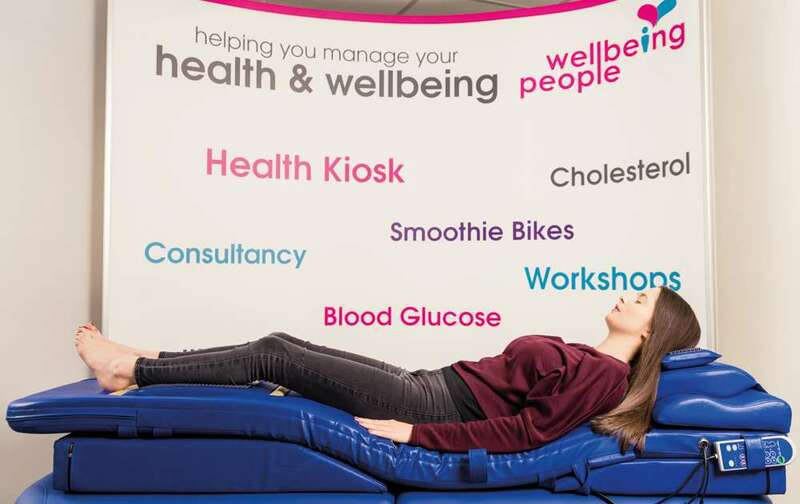 Our physical and mental wellbeing are very closely linked; massage can even help reduce high blood pressure and heart rate, relieve anxiety and improve sleep. A quiet air conditioned or cool room is ideal for both the Cyclo-ssage System and/or the onsite massage therapy sessions. It needs to be a place that won’t be disturbed by phones, opening doors or interruptions. Reduces stress, pain and muscle tension. Aids relaxation and promotes healing. An energised and higher performing workforce.